Arunachal Pradesh Deputy Chief Minister, Chowna Mein on Tuesday submitted a memorandum to the Union Minister of Road Transport and Highways Nitin Gadkari seeking early sanctioning of the 407 km long Potin-Pangin Road (National Highway-13) including funds for repair and maintenance of four major bridges, 35 km Hukanjuri-Khonsa road, remaining 20.6 km (Package B & C) of 4-laning of Itanagar – Banderdewa road (NH-415). Mein also called for early sanctioning of the balance work of the ‘Lalpul-Manmao-Changlang’ and ‘Longding-Tissa-Khonsa’ roads, the contract works of which were terminated earlier due to non-performance of the contractors. The Deputy Chief Minister also sought to sanction remaining fund of Rs 103.99 crore out of Rs 113 crore which is required for permanent restoration works damaged by landslides and floods during the year 2017-18. The Ministry had so far allotted Rs 9.01 crore only for temporary restoration. Mein further sought an additional amount of Rs 45.71 crore required for restoration of flood damages occurred during current financial year up to August 2018-19 and also another allotment of Rs 200 crore during the current financial year for FDR and maintenance work. Mein further requested the Union Minister for formal declaration of four numbers of existing state roads that were earlier approved as national highways in principle namely, Akajan–Likabali–Bame (120.00 km), Margherita–Changlang (44.00 km), Daporijo-Gerukamukh road (Dumporijo) to Gerukamukh (Assam/Dullangmukh)-Gogamukh at Dhemaji district in Assam (125.00 km) which comes under Green Field Alignment and the Tezu–Chapakhawa road via Sunpara (59.00 km). The state has a total of 72 packages with total length of 2537 km under national highways having a tentative cost of Rs 25,000.00 crore executed by agencies such as the State PWD, MoRTH (BOT), BRO and NHIDCL. 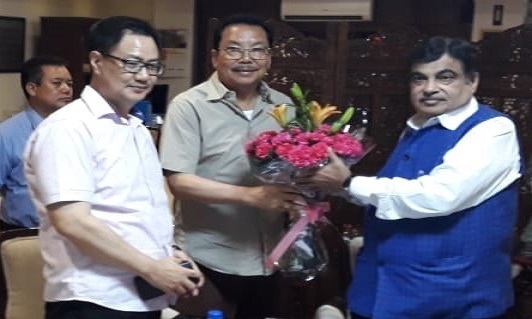 In the meeting, the proposed Arunachal Frontier Highway was also discussed besides the issues and problems in connection with the executing agencies and the contractors. Mein was accompanied by PWD commissioner Bilatee Pertin and chief engineer (Highway) Toli Basar in the meeting.